Beachgoers in Santa Cruz got quite a shock Friday when a white shark washed ashore. 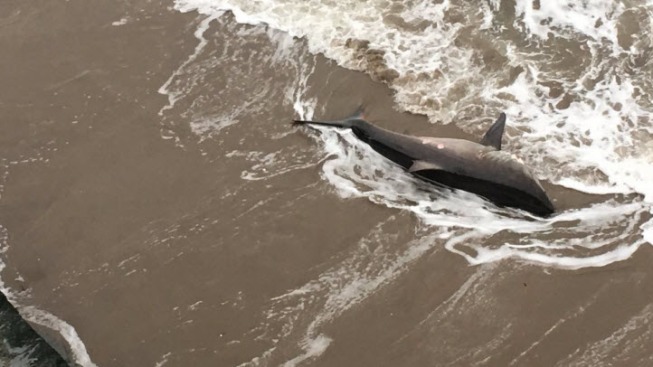 A witness called the sheriff’s office upon seeing the 10-foot shark at Pleasure Point Beach around 4 p.m. Researchers with the Pelagic Shark Research Foundation also made an unsuccessful attempt to rescue the shark. They said it appears that the young adult male shark was likely sick, because it was unable to steer itself. Once darkness set, the shark was no longer visible, and researchers had no idea where it was. They said they plan to return to the beach Saturday morning to investigate whether a rare bacteria — carnobacteroum infection — plaguing sharks along the coast caused its illness. "Currently not looking optimistic in terms of rescue," researchers wrote on the foundation's Facebook page, adding that they are trying to arrange a necroscopy. To support or volunteer, people can email psrf@pelagic.org or call 831-600-5214.